My discovery of Jonsi and his band’s music (see the story elsewhere on this site) late in their career is a case in point. As is the film Extremely Loud & Incredibly Close, directed by Briton Stephen Daldry with a screenplay from Eric Roth based on Jonathan Safran Foer’s novel. The film has all but dropped off the Oscar radar and has been the subject of mixed reviews since its limited US opening at Christmas. (It goes into wide release in the US on January 20, the UK and Ireland on February 17 and Australia on February 23). When I went to a screening a month or so ago, I was trying to suppress my preconceptions, many of which have subsequently featured in others’ critiques of the film. Among them were concerns about two of the leads: Tom Hanks, as fine an actor as he is, has a hulking persona and jolly public image that sometimes leaks too easily into his films while Sandra Bullock, as admirable person as she seems, has never really held my attention on screen. What’s more, I’d heard from a colleague that the child protagonist, first time actor Thomas Horn, gives a confident though “irritating” performance. But my primary fear was the pivotal subject matter: the events of September 11, 2001. I cringed at the idea of what ‘Hollywood’ was going to do with the issue in this instance. I knew Foer’s acclaimed novel didn’t rely on melancholy, but often filmmakers just can’t help themselves. The opening scenes did little to quell my fears as Hanks’ character oozed half-glass full positivism and Horn seemed giddily intelligent and quirky, not necessarily in an endearing sense, as nine-year-old Oskar Schell. However, the film is a surprisingly, satisfying slow burn. It introduces small complexities and gradually adds layers rather than going straight for the throat and expecting the horror of September 11 to be enough for us to buy into a family’s personal experience of the day and the dam-burst of emotions that victims and their love ones must have endured. Magnificent supporting performances from veteran Max von Sydow and Viola Davis were enough for me to give over to the movie’s peculiarities and Bullock, as the grieving wife of a victim and mother of an extraordinary son is (uncharacteristically) restrained and downright mesmerizing. Young Horn was on a hiding to nothing in his role as a kid who likely has Asperger’s Syndrome, venturing out into the world to find the lock that matches a mystery key left behind by his father on September 11. He may well have played the character’s quirks too well: Aspies often have a ‘school masterly’ tone and a sense of self-preoccupation that can be off-putting. His character’s sometimes stilted, then occasionally panicked reactions seem pretty close to the mark but didn’t make him easy to like or empathize with, Hollywood-style. I fully understand why a good slab of critics and punters are lukewarm on the film – and quite possibly if I were to see it again, I might be inclined to agree, in part. But the singularly positive experience of that screening has stayed with me for weeks and is another reminder to check my preconceptions at the door. 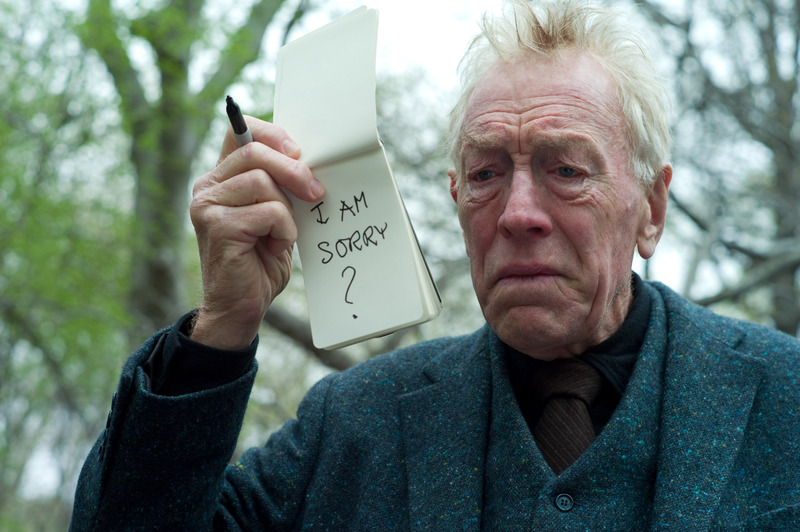 This entry was posted in Film and tagged Extremely Loud & Incredibly Close, film, Max von Sydow, Safran Foer, Sandra Bullock, September 11, Stephen Daldry, Thomas Horn, Tom Hanks, Viola Davis by Greg Truman. Bookmark the permalink.